would find at the end of the world." They are not your typical friends...a blue stuffed elephant and a equally stuffed yellow mouse. Their boat is not typical for an arduous sea journey to the end of the world. Their friendship and trust in one another is charming and enticing. Their shared adventure cements that friendship and offers up a lovely tale for young readers. "What," Hopper asked his little friend Wilson, "do you think it's like at the end of the world?" "but I bet there's lots of lemonade! Hopper wants a 'staircase to the moon' and a chance to reach out and touch that brilliant orb. Off they go! They trek on, enjoying the peace and tranquility of the water, the beauty of the night sky and being together. When a gale blows up, the boat is tossed from pillar to post and ends up with only one passenger. Hopper is lost and Wilson is desperate to find him. His queries are met with unsatisfactory responses and he becomes more and more alarmed. The bird, that wise and observant children have been watching all along, provides needed guidance to end their voyage. What a surprise for all! The watercolor art is as dreamy and gentle as this lovely story, except for the green, choppy seas and the howling winds of the storm. There is much to see, and admire about the artist's use of white space, perspective and expression. Hopper and Wilson are tiny in the wide world; they are also comfy together and delighted in one another through the good times and the bad. It is virtually impossible to do justice to this incredible book of poetry. But, you need to know about it and I need to tell you what I can. I have read it many times, and still have not made all the discoveries there are to make, I am sure. He takes one word. And then he uses only the letters from that word to create a POEM! How does he do that? I still can't completely figure it out. I can tell you it has made me think and try, and then think and try again...and again...and again. I have tried finding as many words as I can from that one chosen word. I have tried them in different configurations. I am NO poet! Bob Raczka is! "I love playing with words. That's why I write poems. I also love to see how other people play with words. That's why I read poems. One day I was reading about poems on the internet, and I came across the poetry of Andrew Russ. Andrew makes poems out of single words. " So, he tried it. In fact, he tried it twenty-one times. I cannot imagine how many drafts he did. Some are short and some are much longer. Here's the other twist. The letters on the first page are aligned with the letters from the original word line by line. (I could not get that to happen in the opening poem, so I used the completed one). On the following page, the words are printed in poetic form. Sounds complicated...it is, but it remains unique and oh, so worthwhile. I read somewhere that this book was like 'learning to read all over again'. I think they are right. It can be challenging, and a little disconcerting. The words on the first page have no natural breaks or even spaces. There are some that are so charming, I want to hang them on my wall. There are a few where I am still wrestling with the meaning. But, it does not hamper my admiration for his hard work and the results of that work. Lucky are we to have such mentors for poetry! There are many different forms to try. If you have not seen James Stevenson's thoughtful and 'I can do that' poetry in his 'corn' books, look for them. If you haven't tried book spine poetry, look on the internet and see how much fun that can be. And if you have never tried one word poems, they can help you make new discoveries about yourself, or give you sleepless nights. Bob Raczka makes me believe that 'I can do it' and that's what I want young writers to believe. How about you? She's not a robot, she's his boss! "NAP. ALIEN. NAP. EAT. WASH. NAP. EAT. NAP. CUDDLE. NAP. NAP. UNTIL ONE MORNING..."
On that particular morning, Binky is introduced to a striped ginger cat being fostered by the family. It is hate at first sight and it only gets worse when the space cat realizes that a lot of sharing is going to be done...food, home, toys. Binky will soon change that! He tries, to no avail. The only way he is going to get rid of her is to 'get the goods' on her. Being equally as good at spying as he is at protection, Binky sets out to see what her motives are. What he learns is that Captain Gracie has been sent to put him through his paces, and to evaluate him. She is quick to bring up past errors. Binky is extrememly confident and sees no reason to be concerned. He knows his skills and abilities. 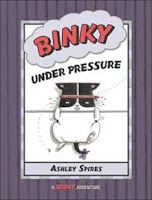 Gracie's many attempts to outwit him prove problematic for Binky. True to space cat and alien invasion tradition, Binky proves himself worthy of his humans' trust and a promotion. The delight on this young girl's face is evident for all to see! As she stands under the shade of the tree's dense leafy canopy, she is filled with joy...the joy that a tree brings in so many ways. You cannot talk about Barbara Reid's books without awe at the incomparable illustrations that bring her stories to life. I had no idea how much I was looking forward to seeing something new from her! She never disappoints, and I will say that I think her work gets better every time she publishes a new book...is that even possible? The brilliantly-colored, light-diffused cover is a perfect invitation to further investigation. Then, I couldn't get past the endpapers without a slow and deliberate look at each image. This sampler of what will follow offers trees seen at all times of the year, and a changing color palette which will evoke many memories for its readers. I felt the stories building as I passed from one small picture to the next. "There is more than one way to picture a tree." So true! 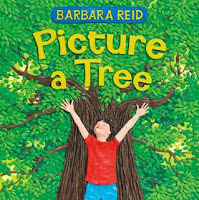 Barbara Reid moves her readers forward from page to page with beautifully detailed scenes from all seasons, settings, perspectives and moods. She dedicates the book to her dog, Ruby and we meet said dog on the title page, and I think we see her again on the tunnel of trees page...oh, and again later in the story, too. The high-rise home of the tree is mirrored in the high-rise apartments in the background, showing great diversity in both places. Oh, and then there is the 'Z & T CAFE', perhaps named for daughters Tara and Zoe. I will pore over its pages again and again, always discovering something I hadn't seen in earlier looks. I will continue to be awed by the lovely and thoughtful words Barbara Reid chooses to show her abiding love for nature, and trees in particular. a chilly wind began to blow. This is TOO much fun! Kids will be hooting and hollering as they meet the chickens who live 'on a teeny little farm, in an itty-bitty coop' and must share their space with a colossal chick. No one knows just what to do with the chick, including the chick itself who is mistaken for an elephant by the smallest chicken, who is 'not the sharpest beak in the flock'. You know where I'm going with this...a fractured fairy tale which takes its storyline from Chicken Little. The humor is exhausting...my sides ache when I read it with kids. No matter what happens in the chicken yard, rooster and his three friends...the small chicken, the smaller chicken and the smallest chicken have comments to make. They think they are knowledgeable about the world and offer up comments at every turn. "I've never seen a squirrel do that," crowed the little rooster. "Not very squirrel-ish at all," clucked the small chicken. "Squirrels don't keep you dry in the rain," clucked the smaller chicken. "I see what you're saying," peeped the smallest chicken. "Apparently, he is an UMBRELLA!" Poor big chick...he begins to wonder about his own identity. All's well that ends well, as happens in most fairy tales. Listeners and readers are left to beg for 'just one more time!' You won't be able to stop yourself. The artwork is equally hilarious, providing added jokes and speech bubbles that will have listeners in stitches. It's such fun to read and to watch the expressions as each of the new events transpire. And, don't miss the back cover! This would be fun to read alongside a more traditional version of Chicken Little to see what young listeners make of it. It will remain a favorite read of mine for some time to come. peasant skirts and baggy shirts." In the high school that Lori Weber attended there was a third floor lounge. It was where all the cool kids hung out, and she makes it her starting poem for this novel in verse about five young people and the lives they are living. She gives them strong voices, and shows her readers how each is affected by the connections that are between them. Stacey seems happy to be that girl and she and Annabelle no longer spend time together. "I suppose that outburst, if I can call the first poem that, had been lurking in me for a long time. That feeling of walking through that lounge is still so strong, I can close my eyes and conjure it. Writing is a matter of tapping in to deep emotions, to exorcising demons, and that was one of mine." The five people whose stories she tells speak with clarity and individuality. Their personalities are as different as those voices and they are very capably drawn, leaving her readers empathetic to their feelings and actions. The poems are written to reflect those voices in ways that match their personalities. Christopher's poems are written in quick spurts and take up a long, thin space. He is so shy about sharing his feelings for Annabelle. Mark's are bold and meandering, as are his thoughts. Mary's are contained in gray boxes and show her unwillingness to come out of her safe place...preferring to be alone with her piano and her talent. I really like that the author included the voices of the parents...offering a completely different view for the reader. They fear for their children, but learn that they must let go and trust that they will find their way. It is very meaningful that they have a strong presence and can voice those fears since they have had such influence in raising these memorable young adults. 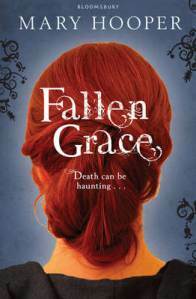 I want to share a few of the voices the author so ably creates. when she sees me with Christopher. because he stuttered like a machine gun? when his skin has patches of acne?" lamb when he and my mom come to visit." "How you ended up with this book is not important. Maybe your parents gave it to you. Maybe you bought it for yourself. Maybe you found it in a ditch. It doesn't matter. The thing is, you have it, and now you have to use it." Wouldn't it be good if it were that easy? Evelyn Raab does everything she can to make it so. In this new edition she teaches the interested teen how to cook; but, that's not all. She also gives advice on using the gadgets that are available in the kitchen to make life easier, making a grocery list that reflects your new interest in making delicious recipes using real foods, and even making menu plans. What more can you ask? She does start 'from scratch' and provides some interesting recipe types that are sure to garner interest...cheap eats, Mom food, vegetarian, cooking to impress and dinner for the family. 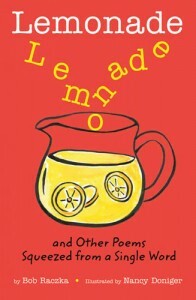 She writes with humor, simplicity and a belief that teenagers can learn the basics of cooking without too much trouble. There are few processed ingredients and some will certainly become favorites. You might take a look at the chocolate chip cookies as a starting point. YUM! "They also contain (almost) no processed foods - no cake mixes, no condensed tomato soups, no frozen whipped toppings. You don't need them. Ever. Cooking from scratch is easy and cheap, and always tastes better. That's a fact." Assemble everything you need before you start. Finally, there are no rules." Perfect advice that will hold novice cooks in good stead. I can almost hear my Mom telling me the same things. And speaking of that, cooking with your teenager is a great way to get some quality time together. It always helps to have help when you are beginning any kind of new project. There are two hundred recipes, lots of sage advice for culinary exploits, and you will be better for having used this book. The subtitle says it's for teenagers. Don't you believe it! There is much here worthy of everyone's attention and learning. Besides the cookies, I encourage you to try the Curry Glazed Chicken and the Greek Baked Shrimp with Feta. You won't be sorry! As a consummate fan of everything that Margartia Engle writes, I can say that I continue to be 'wowed' by her work. 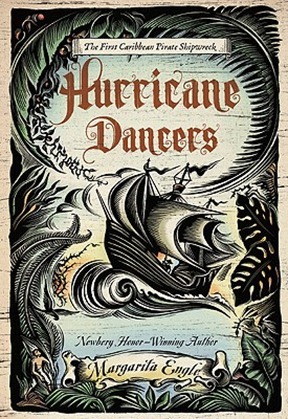 In this beautifully written tale of the first pirate shipwreck in the Caribbean in the late 1500s, she introduces characters who will not soon be forgotten. Quebrado is a slave on pirate ship, treated abominably by the pirate captain Bernardino de Talavera. He is the child of a Taino mother and a Spanish father, and has a foot in both of their worlds. He speaks both languages which will hold him in good stead when the ship flounders and sinks from the force of the wild hurricane winds. The ship also has an important hostage on board, Alonso de Ojeda. He is a callous and cruel conquistador, whose past sins continue to haunt him. He wants desperately to find a way out of captivity and hopes that the shipwreck might afford him the chance he needs to make his escape. Quebrado is saved from certain death by the young fisherman Narido. He finds a place for himself with the island people. He feels safe with them and begins to think of his life as he lived it before slavery. Unfortunately, both Bernardino and Ojeda also survive the cruel seas and eventually find 'their' slave. As the reader we feel everything...the terror, the pain, the intense love that Narido feels for Caucubu and the hope that is in Quebrado's heart despite his many horrendous life experiences. While there is darkness, there is also light. It is a magical read, and I encourage you to find this engaging and uplifting book. In an author's note, Margarita Engle speaks of her fascination with this shipwreck and her family history that led her to discover her roots as an Indigenous Cuban, descended from a long line of women like Caucubu. In a further historical note, she discloses her research finds about the historical figures who people her story. Quebrado is fictional. The others are not. She relates the characters and events, the culture and language and the literature that has been telling this love story for five hundred years. Amazing! "These tiny birds are able to hover by flapping their wings in figure eight patterns. Their wings are made of bones, like in your hands, instead of arm bones like most birds, which make them more maneuverable. The resting heart rate of most hummingbirds is 50 to 180 beats a minute." The fact gatherers at home and in school classrooms are going to love this book. It is great fun to read, and a valuable resource as well. It is filled with a boatload of information about all those extraordinary, and ordinary, things that happen in the speedy span of sixty seconds. "Eager readers purchased 1,111 copies each minute on the first day of sale of Harry Potter and the Half-Blood Prince, book six in J. K. Rowling's popular Harry Potter series." "Each minute, 30,00 to 40,000 pieces of dead skin are lost. Even though the skin is not typically thought of as an organ, like the kidney or liver, scientifically it is." It's just the kind of stuff you can share at the next dinner party, isn't it? Or, that will make you cringe when your fact-laden young reader wants to share new learning with anyone interested in listening. 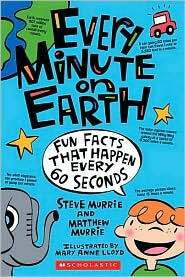 You will be hopping all around its pages to discover the next fascinating bit that happens 'in a minute'. The book is divided into eight chapters...earth, space, the human body, technology, animals, food, pop culture and sports. Where would you start? Take it with you when the wait at the restaurant might have you needing to keep the kids entertained. Or, what about the next road trip to an out-of-town game or family visit? I always have a book in my car, just in case I get stopped by a train. This book would be the perfect way to make that time pass more quickly. In school, it might be just the thing to get a young researcher interested in pursuing a new topic. This father and son team have included more than 200 bits of data to intrigue and inspire their audience. One a day would take you way past half the year, and fill your heads with a lot of 'stuff'. They also include two activities at the end of each chapter. Finally, there is a section on source notes and a complete and useful index. What you have to keep reminding yourself is that each of these things happen in just one minute! "Krispy Kreme doughnuts are produced at the rate of 5, 208 doughnuts a minute. That totals 2.7 billion a year." "Food moves 1.1 inches (2.8 centimetres) in the small intestine every minute." "A woodpecker can hammer with its bill 150 times a minute." "Ben tried to imagine the honking, screaming, screeching soundtrack, but to him it unfolded noiselessly, like a scary movie with the sound turned off. All he could hear in his mind was David Bowie singing about Major Tom." If you loved The Invention of Hugo Cabret and wondered if you could wait for a new book by this incredible artist, wait no more. September 13, one week ago, was the release date for Wonderstruck. IT WAS WORTH THE WAIT!!! "I thought: Is there a way of combining what the cinema can do with panning, and zooming in and out, and edits, and what a picture book can do with page turns, and what a novel does?" I guess there is...because he has done it TWICE! His illustrations work just like a camera, following his characters as they make their way from one place to another. He uses his zoom lens to focus on details of facial expression, place and time. It is unusual, and mesmerizing. "I had this idea to try to tell two different stories." "What if I told one story just with pictures, and then told a completely different story that was set 50 years later with words? And then had these two separate stories weave back and forth until they came together at the end?" Who else thinks of such things? Not only that; he goes right ahead and does exactly what he planned! He tells his audience the story of Rose and Ben, both of them young when we first meet. Rose lives in New Jersey in the late 1920s when silent movies are all the rage. Ben lives in Minnesota in the late 1970s, with relatives since the recent death of his mother. Rose's story is illustrative. We come to know her in the black-and-white artwork that Selznick so carefully and powerfully constructs. Her story alternates with Ben's, which is written in novel form. Their worlds do have connections. Rose is deaf, and Ben completely loses his hearing during a summer thunderstorm when he is struck by lightning. Each of them is caught in a storm. They both go looking for a parent, Rose for her mother and Ben for his father. They find solace and shelter in the Museum of Natural History in New York. They know about Kincaid's Book Store. They are enthralled by the Cabinet of Wonders. Daunting at more than 600 pages, and too beautiful to accurately describe, it is a quick read because of the wondrous illustrated sections. Those sections create such drama and mood for the tale being told. The reader is completely caught up in the action and the characters' development. Brian Selznick constantly adds detail to the art that have readers asking questions, making inferences and providing a stunning reading experience. If you haven't read Hugo Cabret yet, get to the library and have it on hand. When you are through being Wonderstruck, you will want to continue the magic of this gift to all readers. Bravo, Mr. Selznick! Don't miss the notes at the back...acknowledgements and bibliography. They will give you some sense of the research that was required to bring this book to publication. "Maiko's favorite baobab was more than 2,000 years old. 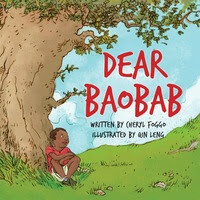 "When this old baobab tree was a baby," his mother used to joke with him, "that tall mountain over there was just a pebble."" Maiko is seven and he lives with his aunt and uncle in Canada. His departure from Tanzania came due to the death of his parents and, as would be expected in one so young, Maiko is experiencing a great deal of sadness. He is also homesick for the baobab tree in his village. It was a place of shade, comfort and safety for Maiko and his childhood friends. He comes to live in the red brick house, and grows to love a small spruce tree that grows too close to the foundation. That tree and Maiko have much in common. They are the same age. They both had been planted in the wrong place. But, Maiko listens to the sound of the tree and imagines its story, and he is comforted. When he hears that the tree may cause structural problems, he is concerned. When he sees an axe and a saw, he hides them away to protect his new friend. His aunt and uncle seem to forget about cutting the tree down, until the day that they announce they will cut it down for their Christmas tree. Maiko cannot stand the thought! He runs off to the silence of the nearby forest where he can think more clearly, and comes to a realization that all his hopes for the little spruce tree cannot possibly happen. Uncle Peter finds him there. Finally, Maiko is able to voice his sadness about not belonging, just as the little tree does not belong. Uncle Peter assures him that they will find a solution. Your nose is as long as a telephone wire,"
And I still lie a lot." My first copy of Where the Sidewalk Ends has an elastic band tied around it to keep it together. It's cover is brown, with no observable letters on the spine, or images on the front. It has been loved, almost to its death. But, I persevere and take it with me whenever I do poetry workshops or do 'poetry weeks' in schools. It lets kids know how important it is to me, has been to my kids at home, and was to the kids in my classrooms since I discovered it in 1982. It was first published in 1974...all those years without it! That discovery was sweet! I had promised a second grade class that we would be reading a lot together and that every day I would read to them...one picture book (at least), a chapter from a novel (maybe more) and a few poems (always ended up being about ten). Shel Silverstein was our first poet. The kids got so they could call out page numbers and they would hear their favorites on a daily basis. I can still recite 'The Crocodile's Toothache' word for word, which grabs the attention of any child listening. From spaghetti ' up to my elbow - up to my face' to the dentist who met a crocodile with a tooth ache, they just kept calling out names and pages...we almost wore that book out. And when I was finished reading to them, the kids borrowed the book for their silent reading time, which often was anything but silent as great guffaws erupted during that reading. It is a lovely memory. We went on to share The Light in the Attic and Falling Up with the same attention and enjoyment. How lucky we are to welcome a brand new book by this funny, funny man, almost twelve years after his untimely death. The poems included in this new book were selected by family members from his archives. He had so much to share with us! So today, on its publication date, I want to tell you a bit about 'Every Thing On It'. Well, it's a perfect match to the other three and I am thrilled to add it to my collection. It has lost none the verve and hilarity that Shel Silverstein brought to earlier works. I have only read through it one time; but I do have favorites already. And, I know someone is going to get a copy for Christmas...or, a few someones. I have many post-its marking the pages that I want to read again. I will surely be sharing it wherever I am this fall and winter. I will be reading parts to my kids - over the phone because they live so far away; but, it will bring back wonderful 'other' times when we shared his work and learned a love of poetry. Someone smarter - someone new? Someone better - maybe YOU!" "If you haven't done it before, cooking can seem a bit daunting, so the recipes in this book explain simply and clearly how to make things." I don't know exactly how she did it, but my daughter found a wonderful man who loves to cook (and cleans the bathroom). To prove just how smart she really is, she married him this summer...not once, but twice. First in Victoria where they live, then in our backyard so that they could share their happiness with friends here. Most nights, Andrew has supper started before Erin gets home from work. It is a lovely thing! It can be so much fun to cook together. Why not start with friends when you are in your teens? This book is perfectly set up to help interested teens learn the basics of preparing great foods, and then moves them forward to try adaptations that include their own favorite foods and flavors. There is a short discussion of the food groups, their benefits and bringing balance to the daily diet. Quickly, the book gets right to the 'meat' of the message. Good food can be made quickly and still be healthy and hearty. Soups are the starter...a wide variety with suggestions for crunch, and accompaniments. Salads are up next, beginning with a filling and tasty Salad Nicoise. All the foods in the first section use familiar ingredients, are made quickly and provide nutritious meals for all. "Everyone needs to eat one main meal each day to keep them going, so learn how to cook what you like to eat - a warming stew, a big plate of pasta, or a spicy stir-fry. Be sure to make enough. Hungry people appear from nowhere when there are tempting smells and the sounds of activity from the kitchen!" Maybe it's because it's just before supper when I am writing this; there are numerous recipes that capture my attention. I like the variety, the clear, closeup photographs, the subtle changes suggested if ingredients are not readily available, or don't suit the cook's taste. Presentation is an important component...we all know how much more appealing a meal can be when it is presented in a pleasing way. As with meals for many, the last section is 'something sweet' and includes everything from a simple fruit salad and smoothies to a more time-consuming profiterole. Lest you think you are done....why not try some baking magic? Rolls, homemade pizza crust, pies, brownies and delicious looking ginger snaps are suggested as a way to ply your hand at the art of baking. Finally, tricks and tips are described to help make the cooking experience easier and more productive for those wanting to learn some basics. Pictures of a variety of herbs and spices (and their uses) are displayed. A glossary of common terms and an index add to the usefulness of this book for the amateur cook. Now, there's a way to talk with your teen! But she was in for a surprise..."
We call those little dots cliff-hangers! They show us there IS a surprise waiting for us when we turn the page. By the time we get to this pause in the action, kids will be rocking in their seats, just waiting for the next great change. 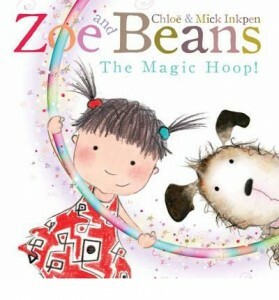 After all, it is a magic hoop! 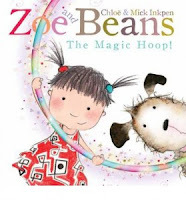 When Zoe first finds the hoop she does her best to encourage her dog Beans to get some exercise by hopping on through it. Beans is not that energetic. So, Zoe throws Binky Boo in an effort to entice Beans to make his way through to where Binky Boo now lies, looking suspiciously like a rabbit. A handful of Choccy Bears is enough incentive to get Beans up and active. When he gets to the other side of the hoop, Beans has also changed. Zoe is delighted with her new rabbit friend. With each jump, Beans shape shifts. First a rabbit, then a mouse. When he becomes a jaw-snapping crocodile, Zoe tires of the game and wants her old dog back. But the surprises are not yet complete. As Beans into an elephant, he also faces big trouble. The hoop is too small and Beans is stuck! OOPS! Now, what? Zoe does her best to help her best friend get free. But nothing seems to work. A diet won't do it. In fact, it encourages ravenous consumption of five additional bags of Choccy Bears, and a sudden spike in weight. What now? I like the font changes which will help the reader lend great expression and drama to the story. We met these most appealing characters yesterday and apparently we will meet them again. There are four books from this delightful father and daughter team, and they will garner fans with each new story. Appealing artwork, endearing characters and magic...what more could we ask? "I really like my name. I always thought that a great way to start a new year with kids in my class was to share books about names with them. It gave them a chance to talk about their own names, to ask questions about the origin for that name at home, and it gave the other children in the class daily reminders about their classmates, and who they were. So, I am always on the lookout for such books to share in my workshops with teachers, parents and student teachers. Lucky me if I also get to share it with kids when I make a classroom visit. quote, there are specific things she likes about it, and she is happy to share her feelings. After all, she has a queen named after her! "My NAME is ELIZABETH Alfreda Roxanne Carmelita Bluebell Jones!!" and don't you forget it! But, you can call her Elizabeth. Everyone gets the message. Matthew Forsythe has created wonderful illustrations using only black, orange and blue. The characters have a cartoon feel which a young audience will surely enjoy. The expressions on Elizabeth's face assure our understanding for the way she is feeling, before she makes her declaration and after she has reminded everyone. We don't hear about her constant companion in the text, but the artist makes us keenly aware of the attentive and quite regal duck as it follows her from place to place. 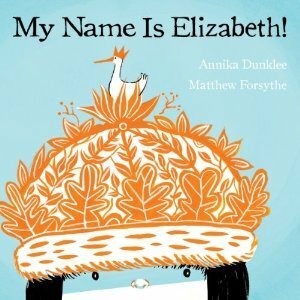 The only person allowed to mess with 'Elizabeth' is her little brother...and she is most understanding of his attempt at such a long and lovely name. "So I fly back to the Fortress of Awesome, deep at the bottom of the deepest, darkest trench under the Arctic Ocean. It's peaceful here. Quiet and calm. I can just lie on the bed and chill for a while. I need to get a grip." "The words need to have some juice to them, some snap. Children are fascinated by wordplay. If a children's book is any good, the language has verve." "I can shoot positronic rays out of my eyeballs. And can I tell you something? Giant killer robots just hate that stuff." There is a lot of invented language here, and I can imagine it becoming part of the talk between fans who have heard the story as many times as they ask for it. They will be numerous! The sound effects will resound as kids eagerly try to channel Awesome Man and his powers. The red cape and black mask add to his mystery. Just as he is about to reveal his secret identity, 'Professor Von Evil in his Antimatter Slimebot' arrives on the scene! A quick change and Professor Von Evil misses him completely. Do you think you can guess who he is? "See, the thing is, I'm superstrong. I have to be careful. I can't start hitting stuff or kicking stuff or throwing stuff around, even though that's what I want to do so badly. I might hurt somebody, or destroy a city or something." I guarantee you will love the surprise ending, and enjoy the perfection of it! If you know The Incredibles, you will recognize Jake Parker's artwork. 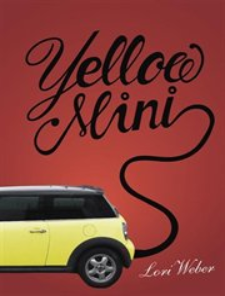 It is bold and bright, but with a soft edge that is perfect match to the children who are going to love this book. Double page spreads, occasional panels and spot pictures keep the action front and center and promise to keep listeners entertained whenever this book is shared. "Reading a story creates this bubble around you. It shelters you, protects you, keeps out distractions. The main thing has to be the physical contact between parent and child." 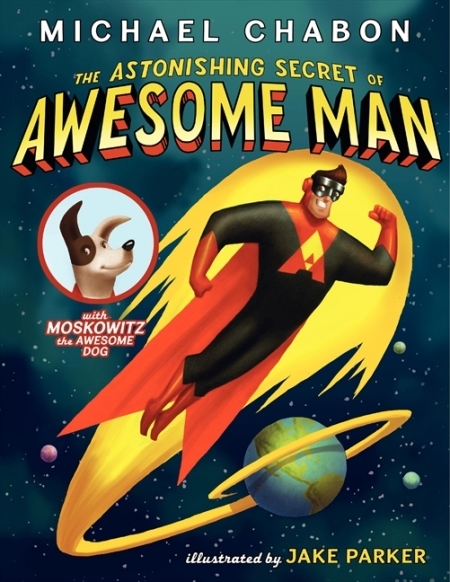 Awesome Man is just the guy to create that bubble of 'reading magic'. 90 miles (145 kilometers) per hour." the day instead of a few large ones." can take twelve to eighteen months." I think that young readers will find this series informative, and also humorous. The format for each is a match, starting with a page citing the other books in the series, and followed by an author's note. That note suggests that the information provided will help the child understand the body and why it works as it does. It also suggests a yearly visit to the doctor, and an immediate trip if something seems amiss. The world's largest scab collection belongs to Steve 'Crusty' Smith from Moose Jaw, Saskatchewan. (False. Collecting scabs is totally gross!)" My 'messy' body is tears, sweat, earwax, snot, pee, poo, vomit, and pus. It's sure to be a favorite. My 'noisy' body is voice, burps, hiccups, stomach growls. farts, sneezes, coughs, and the stethoscope that hears all those noises. OK, this might be the most popular! Finally, my 'stretchy' book is growth, inside vs outside, hair, skin, nails, growing muscles, growing bones and finally, growing teeth. A glossary is included with each which will help readers find their way back to their favorite pages. Written by a broadcast journalist and a family doctor, these books will add to the knowledge base of those children who have questions about how the body works. The artwork adds a playful tone. The series is sure to be a hit for its target audience. "Beans didn't like the new Molly. He wouldn't lick her, or chew her, or slobber on her. He wouldn't have anything to do with her. Where is Binky Boo? he thought." Beans has Binky Boo and Zoe has Molly. But, when Beans loses Binky Boo, he becomes quite attached to Molly and that causes some heartache. Beans forgoes all other pursuits in his sadness at losing his special stuffed toy, a mangy old critter who looks much the worse for wear. He won't fetch, or chase, or accept a bone. He is not interested in anything new....now that Binky Boo is gone, Molly is the object of his affection. This is disconcerting for Zoe because once fetched, Bones refuses to return Molly, the wide-eyed, polka-dot pajamas doll. Poor Zoe! Bones takes Molly to meet his friends and she comes home smelling...well, awful! A hot wash in an abundance of soap should do the trick. Now, Molly has no appeal for Bones! He no longer likes her. The problem is not yet solved...no Binky Boo. A spirited throw by Zoe lands Molly in the sandbox. It is a fortuitous toss! There is lots of humor in the watercolor illustrations created for this likable and familiar story for little ones. The colors are bright, the action is fierce and the expressive characters impress. Kids will love it and will look forward to the next adventure. "Even my aunties were baby crazy. When they came over for our weekly Sweet Tea and Toast Party, they both drank their tea in one huge gulp and ate their toast in two bites without either of them saying to me, "Why, isn't the weather marvelous, dear Lady."" Having a new baby in the house is not going to be all peaches and cream for Gia. She knows that things are going to change; but, she likes them just the way they are right now. Come the first snowfall, her life will be very different. It's enough to make Gia wish that the snow away this year when her Mom tells her that the new baby's arrival should be at about that time. Haven't she and her Mom been doing just fine on their own? Gia likes life as they are living it. It is apparent everywhere she goes that the baby is getting a lot of attention. Her friends at school want to talk about it and her teacher is reading books about it. Her aunties no longer have time for the genteel, ladylike tea party that they have been enjoying every week with Gia. Now, they want to rush through it so that they can talk about the 'ding-dang' baby. Gia is very frustrated by it all. "Some days I sat on my stoop thinking about all the years it had been just me and Mama. About us drinking hot chocolate and telling silly stories. About the mornings I jumped into her bed when it was still blue-pink outside, snuggling up to her while she tried to keep on sleeping." Oh, it's going to be different! After an explosion of anger at the Thanksgiving dinner table and being sent to her home to think, Gia has a visit with her Mama. She is surprised that Mama is going to miss some of the same things that Gia will miss. "Those were the good old days," I said. Mama smiled. "Guess you're going to have to tell the baby all about it." It is a fitting end to a lovely, and real, story of the feelings that older siblings harbor when a new addition is imminent. They are astute enough to know that change is coming and to be suspicious of how they will be affected by it. I like the way Jacqueline Woodson allows Gia to voice her insecurities, and I like that the story ends without real resolution. It has snowed yet, and the baby has not arrived. There will be some work to do. So, you have a new wonderful book about siblings; now you add Sophie Blackall's illustrative genius to the mix. She creates Gia's world with care and concern for the little girl, filling faces with affection and deft expression at every turn. It is easy to see the sadness in Gia's eyes as the leaves fall all around her and the time for the first snowfall nears. 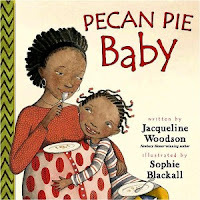 You can also see the mischievous joy as she and her Mama share a piece of pecan pie. As the uncles build the new crib, using almost all of the space in Gia's bedroom, you can feel her pain and her sense of being small in a bigger world that seems focused on the new baby. There is such detail. Sophie Blackall adds so much dimension to Jacqueline Woodson's words. It is a lovely example of a perfect match between author and illustrator. "We have created a culture of reading poverty in which a vicious cycle of alliteracy has the potential to devolve into illiteracy for many students. By allowing students to pass through our classrooms without learning to love reading, we are creating adults (who then become parents and teachers) who don't read much." My husband teased me all the time that the professional books I got most passionate about were the ones where I agreed wholeheartedly with the writer. I admitted then, and will admit to you today that he was absolutely right. I love reading books that I wish I had written, both books for children and adolescents and books for teachers. Donalyn is an incurable reader, and has been for her whole life. Her love of reading has helped make her the person that she is today. It is what drives her teaching, and her life. She brings that obsession to her grade six classroom and creates a community of readers, hoping that their time with her will inspire them to be readers for life as she is. Donalyn has always had high expectations for her teaching and her careful planning gave her confidence as she made her way to the classroom on that first day. She is quick to admit that 'my plans fell apart when my students showed up.' All too true; until we know the kids who will people our classrooms it's a tough task to plan for them. It is a powerful statement to make, but make it she will. We teach children, not curriculum. We need to know our students before we know what they need. Donalyn Miller has yet to meet a child who hasn't become a reader in her classroom. By the end of their sixth grade year with her, most have read 40 to 50 books! That is some legacy. And they come back year after year to talk to her about what they are reading, to borrow books and to spend time with someone who loves what they love. There are no drills and worksheets for her students, but there is always time to read. Her approach is not conventional but it gets amazing results. She helps students find the books that speak to their interests, their abilities and that will keep them reading beyond that first book. Her writing style is very personal and offers 'whispers' that will help teachers wanting to change practice in their own classrooms. Her students provide an 'ultimate library list' to begin an enviable classroom library. In an appendix Donalyn gives advice on setting up that library to best suit both her needs and those of her students. She has much to offer. If reading this book does not inspire you to take action and do what's best for kids, I cannot imagine what might do that. "But the kitty boy wasn't the only Chihuahua on board. His old amigos, Los Chimichangos, were going to school, too. "Thank dog you made it, dude!" exclaimed Don Diego, the biggest of the small ones." 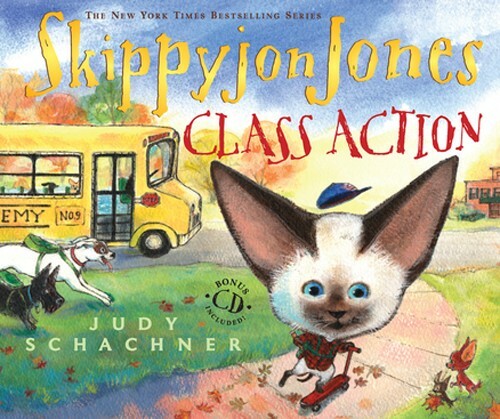 As I sit here listening to the CD version of this new Skippyjon Jones story told in the author's own voice, I cannot help but recognize why kids love him so. His bravado, the thumbing of his nose at authority, his aptitude for leadership among his amigos and his insatiable 'bounce' through life make him everyone's favorite Siamese kitten, who perseveres with the notion that he's a chihuahua! All he wants is to go to school. Mama reacts with an adamant announcement that school is for the dogs and her kitty boy will not be attending. You know about his imagination and the bedroom closet that allows all manner of adventure for the young man in the Jones family. It isn't long until he's on the bus with his amigos and headed for a day filled with one escapade after another. In school, he meets a poodle principal with high standards, a whistle and a bucket of balls for chasing. (It will take time for your listeners to take note of the many breeds in attendance). "The gruesome grumble grew louder, and along with it came the rattle and plink of the terrible tazalita. It was spinning wildly, right under his nose, circling like a polka-dotted shark." His friends help him change into his superhero alter ego, donning mask and cape to do battle with the bully. A quick spin in that particular teacup has El Skippito Friskito turning green and wondering about his own sanity at agreeing to battle the bull-ito. What a surprise when they finally meet the wool-clad bully bad guy! It's such fun to read Skippyjon's stories aloud. Filled with wordplay and a smooth mix of English and Spanish, prose and poetry, it keeps the tongue limber and ears tuned to the tenor of this his sixth full-length story. All the while we appreciate the shenanigans he imagines for himself, and his eventual return to the warmth of family. I love the acrylic, pen and ink illustrations! They are filled with as much fun as the story itself. It takes careful observation to see all Judy Schachner includes to delight her fans. I can read it numerous times, and am never sure that I have caught all of the sparkly details she includes to delight her readers. Case in point...did you see the sign-in sheet covered in paw prints or the merit bones earned by first graders? "Kids who get called the worst names oftentimes find each other. That's how it was with us, Skeezie Tookis and Addie Carle and Joe Bunch and me. We call ourselves the Gang of Five, but there are only four of us. We do it to keep people on their toes. Make 'em wonder. Or maybe we do it because we figure that there's one more kid out there who's going to need a gang to be a part of. A misfit, like us." Every teacher in middle school would do well to read this book to their class, at the beginning of the year. It is insightful, heartfelt and meaningful to those navigating that rocky middle years road. The Gang of Five have much to teach us about feelings, name-calling and especially about what being a friend actually means. They are misfits. They are funny, engaging and in our classrooms. The journey that the four friends take together is fraught with name calling, bullying and the many other ways adolescents choose to treat one another in classrooms, and in schools. When this book was published it inspired a nation wide event in the United States called No Name Calling Week. Imagine a world where such a thing would not even have to be considered, and then think that even one week gives respite to the 'misfits' who are called those names on a daily basis. Despite the impact it had when first published, and the issues that emerged for those on the receiving end of such abuse, I would bet that not much has changed since then. It is an oft-challenged book for subject matter, and that should scare each one of us. and, well, I think they are the bravest people I know. They are strong enough to be who they are, no matter what names they get called." "Another thing I think about names is that they do hurt. They hurt because we believe them. We think they are telling us something true about ourselves, something other people can see even if we don't. Is that me? we think. Is that who I am?" I wanted to include every word of Bobby's speech...that is its power. I hope that you will care enough to find out what he said by reading it yourself! That is the best I can do with this post...encourage you to take the time to read this worthy and wonderful book. Oh, and don't forget the other two... Totally Joe and Addie on the Inside. Now, we just need to wait for Skeezie to tell us his story. I do hope it's in the works! I will be near the front of the line to buy it. "Is this our new home? But we came so far! Still...we have to go on." When their space becomes cramped and the seven hamster brothers decide it is time to move, their journey makes for side-splitting humor of the best kind. A small, dark hole is not the place for these brothers any longer. At one time, it was warm and comforting. Now, with uncontrolled growth, they take up every nook and cranny of the space and more! A series of panels is able to convey those growth changes dramatically and with growing humor, until we are faced with a scene that has the tiny hole teeming with round bodies, crushed limbs and even a head sticking up out of the top of the hole. NO room at this inn. Off they go into the greater world of the junkyard where an old sofa provided their first hole. From this perspective we can see the whole of the yard; that is going to be important as the action moves forward. Look carefully! Speech bubbles offer a sense of the despair they are feeling about the move. There is a back-and-forth conversation offering nonsensical solutions. One suggestion is to find some holes for each one. They turn out to be a paper tube, some old rubber gloves, a cup, a lampshade, an old boot...you know where they are coming from, don't you? As they move on, they continue asking the one brother who can see anything what's in front of them. A mud puddle is misconstrued as the sea. A dog dish offers a raft for the crossing. They are relieved and jubilant when it is crossed safely. That destination doesn't prove worthy of habitation. On they go, over a mountain, onto the desert, and into an old dryer, which turns out to be dark and cold and hard...not at all suitable. When they get to what they think must be the end of the world, we note that they have attracted the attention of the junkyard's guard dog. And when one of them disappears in the mouth of that critter, it's brothers to the rescue! Think of all they have accomplished; are they going to let a 'beast' get in their way? I think NOT! Perfect, and totally rereadable...over and over again! "No one knew where the transports were headed, only that they went to 'the East'. The Nazis claimed that transports were going to new settlements. To reinforce this deception, they made deportees write postcards back to remaining inmates, saying they were well, just before they were sent to the gas chambers to die." It is interesting that I received two books about Terezin at almost the same time. The first, Requiem, was posted here in late August and is written in poetic form, voicing the terror through a wide variety of people. 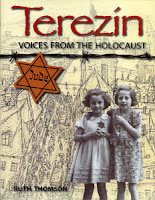 The voices in this compelling book about the Terezin ghetto, speak for the thousands of people for whom Terezin was home during World War II. It is written with younger children in mind, but it is a story for everyone. Terezin was set up by the Nazis as a 'show' camp, a place that would hide the truth of what was really happening in the concentration camps from the rest of the world. Many of the people sent there were artists and other professionals. Many kept secret diaries and painted portraits of life that would tell the world the real truth when they were liberated, or when found following the war. Since they were forced to fabricate stories during their time in Terezin, there was no other way to get their own story told. Their entries tell of the transfer from their homes to the camp, of the looting of everything by the Nazis once they arrived, and of their courage in taking with them some of the supplies they would need to tell their personal tales. The story they tell in their art is heartbreaking and horrifying. Their living spaces were abhorrent, barren and rife with disease. There was never room for the number of people forced to share the space, so the many pieces of artwork show desperation, emaciation and physical deformity. This was not at all what visitors saw when they came to the camp, or what news reporters were given to believe when their questions were asked and answered. The camp seemed a model of a well-oiled machine, comfortable and efficient. Always hungry, often sick and living in terror of the next transport, the people of Terezin bore much of their circumstance with dignity and a belief that their story would be told. If their art was discovered, they were summarily sent to one of the death camps and their work was destroyed. When the Nazis were defeated in 1945, they retreated and disappeared. Russian troops freed the prisoners and the camp was renamed. Today there are 2000 people living there, and many museums are set up to tell the stories of the war years. I like the design of this book, with archival photographs, reproductions of much of the artwork that survived the Nazi regime, maps, sidebars, the many diary entries included, and the wealth of information provided to help us see what daily life in Terezin was like for those who lived there. There is a timeline, a glossary, a list of sources and an index. The timeline helps readers see the many events in perspective...one to the other. We experience the heartbreak of camp life through the art and writing that was left by the many people housed there. The beauty and happiness of the children pictured on the cover is in stark contrast to everything that we now know about Theresienstadt. "Frogs have very special skin. They don't just wear it, they also drink and breathe through it! Frogs don't usually swallow water like we do. Instead, they absorb most of the moisture they need through their skin. They also get water from prey that they eat." A table of contents invites us in with such descriptive and engaging chapters as 'the glass frog', 'the water-holding frog', 'top ten deadliest'. I mean, who can resist that? And then there's the cover. Can you help but be impressed with it? It is the first of many amazing photographs that crowd the pages of this exemplary book of information about frogs and other slippery creatures. We are barely inside when we faced with a page full of such creatures, each suggesting the fun to be had when we take our time to wander through the pages of gathered information. We begin with amphibians and their habitat. We are told that amphibians have soft, moist skin, they live near water and in the rainforest, and that most lay 'soft, jellylike eggs' in water. Moving on to reptiles, we learn that they are quite different from amphibians. Their bodies are covered in dry, horny scales and may lay eggs or give birth to live young. They have backbones and 'vary greatly in shape and size'. We get a look at their innards and their outer bodies, the life cycle that takes a frog from egg, to tadpole, to emerging frog and finally to a fully formed frog. The variety in color and markings among these creatures is quite remarkable and brilliantly displayed in a series of full color photographs. Where they live, who they are, a comparison of size, how they protect themselves....all are covered in brightly colored pages with useful text boxes, games and information bars. "With its amazing see-through body, the glass frog blends in perfectly with its surroundings. This little frog hangs on to leaves with tiny round-ended toes that seem almost to melt into the leaf surface. It lives in Central and South America." Some of the top ten deadliest include the Australian brown snake, the puff adder, the black mamba, and the komodo dragon. Want to know about the others? You need this book! I'm only half-way through...there is much more to learn! "By this time, however, they were so hungry that Grace decided they should use two of their precious pennies for a hot potato each. They began eating these in the relative comfort of a pew in Southwark Cathedral, but after being moved on by a verger, ended up sitting on the stone steps that ran from the top to the bottom of London Bridge." There is something about stories set in Victorian times that really appeals to me. It certainly isn't that life is all rosy and romantic. Rather, it is often rife with poverty and great despair. The characters must deal in conditions that I cannot fathom, and most often prove themselves worthy of admiration for their grit and forbearance. Grace is one such character. Her life is heartbreaking, full of hardship and great sorrow. She never whines or complains about the circumstances that she faces. Although she finds herself in abject poverty, caring for her older, mentally challenged sister without support from family or friends, she pushes forward doing what she has to do to eke out an existence and keep the two of them from the workhouse. She does this with quiet determination, dignity and a great deal of pluck. "May you sleep content and one day may we be reunited." At the funeral she attracts the attention of two people, the deceased's brother and the wife of the funeral director. One offers help if help is ever needed, the other a job as a mute to stand silent and respectful at upcoming Unwin funerals. She takes a card from each. Each will prove useful as Grace and Lily face even more dire circumstances, when the rooming house where they live is torn down in order to build better housing in the future. They find themselves on the street and in danger of finding refuge only in a workhouse, the one place where they never want to be. Because we have come to care for them, we want life to be better than that, too. It is a compelling tale and one that grabs at your heartstrings and won't let go. The sisters are treated abominably, bullied and made to work with the Unwins under false pretences. The skulduggery is rampant, and it takes persistence and intelligence for Grace to finally unravel the mystery. I couldn't put it down once I started reading, and I know that it is a story that will remain with me for a long time. It will also lead me to find other stories by Mary Hooper with hopes of finding other strong, resilient characters in historical settings. "What's your favorite time of day? Playtime! Animals like to play, too - but for them, it means more than just having fun. They learn all kinds of important skills through playing." Animals are just like children when it comes to play! It's how they learn about making friends, running, chasing, climbing and getting themselves from one place to another. As each new animal becomes the focus of attention, young readers have the opportunity to gather information about them. They may already have some stored knowledge and this will just add to that. Plus, they will enjoy the many photographs that accompany the short bits of text. A hamster holding on for dear life to a ladder rung, or tucked inside a tiny tube will have them 'aahing' as they turn to the next page which features cuddly, inquisitive, playful kittens. On to puppies, then lambs and on it goes. Each new double page spread brings fun and great delight in watching the many animals, their antics and it also adds vocabulary that may or may not be new to the reading child. There are captions, humorous speech bubbles, and an explanatory sentence at the bottom of each page. "Dolphins are smart. Just like you, they enjoy doing different things so they don't get bored. They play with seaweed, chase turtles, and play-fight with other dolphins." There is much to learn about the animals of the world here, and as with all great nonfiction, it captures attention while providing new learning. A table of contents, a glossary and an index add to the appeal and help emerging readers discover some of the real pleasures of informational text. It seems I am on a roll with wordless books in the past couple of weeks. I guess that is because there has been a abundance of worthy ones on recent lists. This delightful book shows the power of illustrations to convey the idea for a very special story. When they are set together next to a pile of toys, we know little about the two youngsters. Are they siblings? Do they know each other? Have they played together at an earlier time? How old is the toddler? It doesn't really matter. Patrice Barton creates an irresistable episode from the real world. As if two kids in such a place is not enough, a dog is added to the mix, and chaos reigns! The author needs to say little, beyond a questioning 'woof? 'and the oft-repeated 'Mine!' that tends to happen when very young children try their hands at sharing. It is the way the word 'mine' is presented that adds such drama to the narrative. 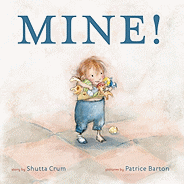 As young readers pore over the pages of this energetic and endearing tug-of-war, they will have much to add from their own initial experiences with the hard work of sharing beloved, or new, toys! Their first look is sure to garner much laughter and a repeated reading. Watching the two interact without adult intervention is pure delight. The older one grabs up everything that can be held, leaving the baby to pick up the last toy. That last toy now holds all of the attraction for the toddler. So real! When a toy lands in the dog's water dish all else is forgotten. Who doesn't love splashing in water? The cherubic baby has the final say at this round of playtime....and it is a charming way to end this very endearing book. There is such warmth in the colors used by Patrice Barton. The faces are filled with expression, including that of the playful pup. She uses motion with great skill, showing it in a series of dotted lines that guide the young reader from one incident to the next. The toys are familiar and might offer up stories from those who recognize them. The endpapers give us hope the two will meet for another round of play...one parent picking up a happily waving baby while the other scoops up the soaked socks of her toddler as the happily waving hand is mirrored. "Nora, you're the strongest of all of us. Somewhere inside, you know it. think that it was I looking after you." Anyone who has lived in a small town will recognize Argue, Saskatchewan. There, everyone knows what's going on with every other single person who lives there. They all know about the Loney family. George, the father, has been on a downhill slide since his wife Margaret died in a car crash. George was driving and it's said he smelled of alcohol at the time. In order to provide care for his four children, George has married Effie. She has no love for the children, for George; in fact, for life in Argue. She makes life miserable to the Loneys. "Everyone in town knows what happened to us. Don't need fire to spread a rumor. to live with relatives. What relatives? Only one I know about is Mama's sister, Louise. Lives in Ontario - big brick house - and five children. I doubt she'll want the likes of us." Together, they do their best to stay together; it is a bleak existence. The children manage with help from their watchful parents, and a few kindly, concerned neighbors. It is the children themselves, their strength of character and willingness to do anything to stay together, who make their lives work, despite the many hardships. "If you ask me, Argue's full of crazy people. She seemed pleased. Speechless, truth be told. having simply taken from it. that which was expected of me." Through the trauma of their many dark days, the Loney children remain a family unit, in the best sense of the word. When they are finally able to leave Argue, they leave together...and that is as it should be. What a powerful and memorable free verse novel this is! Thank you again, Pamela Porter! blanket since we were born. But we are big girls now." Identical twin girls who not only look alike, but share everything. Sharing can be a dilemma for anyone. These cherubic children know about sharing from the time they shared space in 'Mommy's belly'. The pictures on the wall illustrate many proud moments. "I'm five, too. We're twin sisters, silly? The blanket has gotten too small for both of us." What are they to do...two girls, one blanket? They have ideas, but those ideas do not include sharing. It leads to anger and a alienation. Twin beds, one blanket...something must be done! Off they go to buy new fabric for their own personal blankets. After help from her daughters in preparing the fabric, Mommy is ready to sew them. Of course, there is an arugument about whose should be done first. I love the fact that the author has a clear understanding of the dialogue that goes back and forth with five year olds. They are honest and upfront about their insecurities, and their feelings as life begins to change for them. They have a little spat and find a solution, then find something else to cause an argument. In the end, Mommy finds a perfect solution as to who should get the original blanket...and peace reigns. 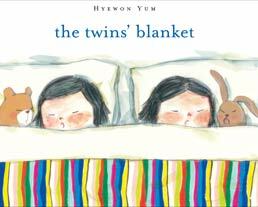 Hyewon Yum uses white space to perfection in this winsome book about siblings. Because of that every detail stands out for her young audience to enjoy. One twin on one side and one on the other give us a sense of their individual selves, while understanding they share the same space. One on one side of the bed, one on the other; one on one side of the blanket, one on the other; one with her back to the other in the centre of the full page spread...I could go on. There is so much to see and enjoy as you share this with eager listeners. It is delightful! 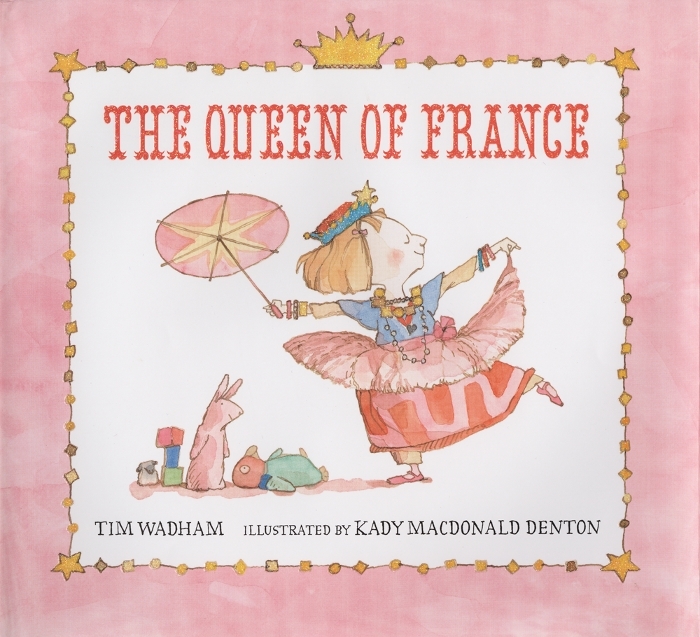 "The Queen of France went to Rose's room. She took off the necklaces. She took off the bracelets. She put them in the jewelery box. She took off the crown. She put it in the make-believe basket." I wish you could see the sparkle on the cover! We had a dress-up cupboard, with drawers filled with a collection of props that lent themselves to days of pretend play. We also had a pair of kids who loved to drag rooms full of toys, and a mixed bag of anything else they could commandeer to build forts, houses, school rooms and Star Wars environments. They just didn't like putting it all back. It was an enormous amount fun to watch their play. Rose has a 'make-believe basket' and it lends itself to allowing Rose to take on the persona of the Queen of France, which she does with great gusto! Once ready she is off to the garden to visit with Rose's mother and to see if she might know just where Rose is. It seems mom doesn't know, but she hopes that Rose will soon return and get her room cleaned up. When the Queen gets a thorn in her finger, she is off to see the Royal Physician for medical care. On her route she meets Rose's dad. He doesn't know where she is; but he wants the Queen to remind Rose of the pirate story they have planned for bedtime. Once back in her room, the Queen reverts to Rose. She bandages her own finger and heads for the kitchen. She wonders if Mom has seen the Queen of France. Nope. Back she goes to her room...no Queen there. Because the room is not clean, she works to make it so, with help from a menagerie of stuffed animals. And then becomes Queen again! The Queen is 'shocked' to see Rose's mother cooking without help. And so it goes with the Queen deciding she will trade places with Rose, until she recognizes how much her mother and father will miss Rose. Off she goes to the royal palace. What a wonderful readaloud this is going to be! Kids will love being in on the joke that Rose is really the Queen and vice versa. It might even encourage some imaginative play of their own. As in the best picture books, the tender and engaging watercolor artwork is the other side of a perfect coin. Without Kady MacDonald Denton's whimsical characters and lovely backdrops it would not have the same impact. She constantly changes the visual aspect of her images, from full to double page spreads, from spot illustrations to detailed scenes inside and outside the house. There is so much here for readers to see, all adding to the visual impact of this entertaining story. Take a close look at the contents of the 'make-believe basket' to know the scope of Rose's imaginative play. I love that the demeanor of the two characters is so obvious...The Queen elegant and uppity, Rose confident and caring. The text borders change to reflect the character at hand. My favorite illustration is the clutter that is Rose's room as she prepares for her new role...the stuffed toys, the princessy pink backdrop, and the regal bearing of a young woman about to become queen. Behold, the Queen of France!